5 What Does This Data Mean if I am Selling a Home in 2017? Enjoy this Tarrant County Real Estate Market Report for January 2018. You may also search for homes for sale and save your favorite properties. Set up a search and be alerted when new properties matching your criteria come on the market. 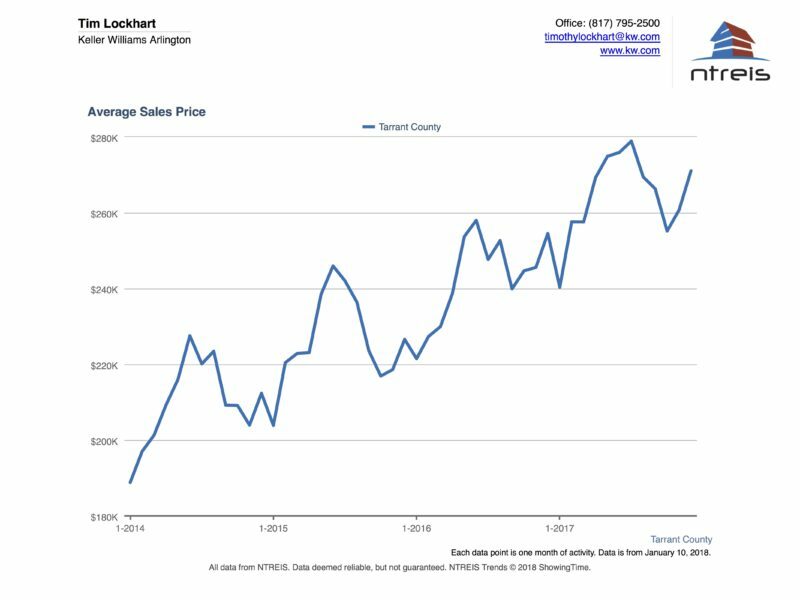 Here is a look at the Tarrant County Real Estate Market for December 2017. Compared to the same time last year, November experienced a 11.5% decrease in closed sales with an 4.5% decrease in new listings and average days on market of homes for sale in Arlington TX remaining around one month on market. In the last 3 months there have been 784 listings expire without being sold. The trend in original list price has increased 6.5% from $254,545 in December 2016 to $271,061 in December 2017 with average list price to sales price ratio at 96.9% indicating that even though there has been a monthly decrease in home sales, the market trend continues upward throughout this year is resulting in higher prices. Although the average sales price has leveled off from a high point earlier last year. 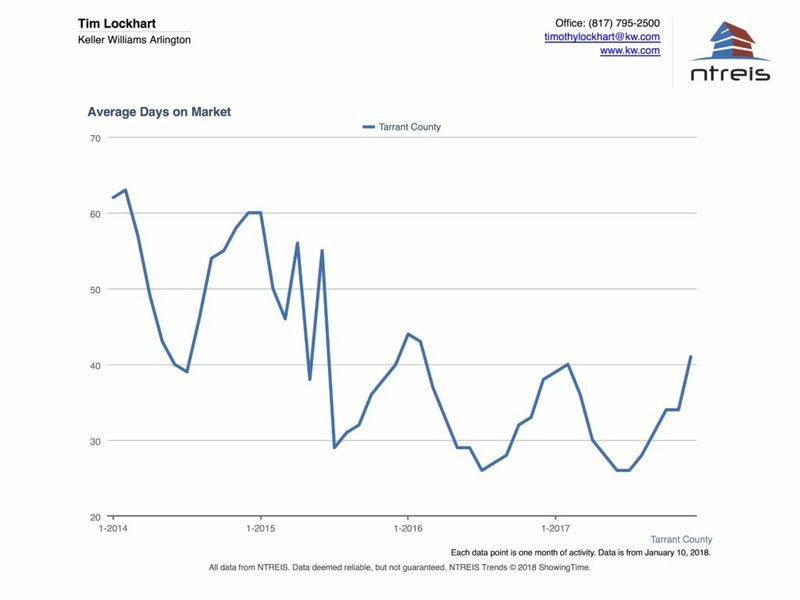 When we look at the market trends the month’s of inventory is a key number. This number is the total number of home sales in a given month divided into the total number of active listings. A neutral market is considered 6 months of inventory. Anything less than 5 is considered a seller’s market and anything greater than 7 is considered a buyer’s market. What Does This Data Mean if I am Selling a Home in 2017? Want to beat the competition? In the spring and summer you will have more competition. Now might be a really great time to sell a home. After coming off 4 years of record sales and prices, we are due to see a slowing of the rapid growth. However, market conditions remain strong and the job market which is a primary driver of real estate remains great. It is now the first of the year and the holidays are behind us. Now, I’m sure you know the common wisdom that the best time to sell is the spring and summer? It is absolutely true that a larger number of homes sell during the spring and summer. However, since “everyone knows that”, your competition is waiting for later in the year to put their home on the market. There are qualified buyers out in today’s market as indicated by the extremely low days on market and rising prices, and these buyers who need to find a home now are not willing to wait for homes to be listed in the spring. Therefore, they are going to choose from lower inventory meaning you have less competition. And, what happens when there is high demand and low supply? What happens to prices when that toy every kid must have for Christmas starts running low on the store shelves? The supply and demand law states that when supply is limited and demand is high, then prices go up. There will be fewer showings when it is cold and dreary outside which is good for the fact that you will be inconvenienced less, and the buyers who are in the market now are much more serious. So, there are fewer, higher quality viewings during this time of year. Are we beginning to see a shift in the market? We truly won’t know that answer until a few months after it happens when we can look back and say, ah yes, there was the top. It looked like there was the beginning of the shift last fall, and now prices have started rising again. There are some signs indicating a shifting market, however no one can really know where the exact top of the market is until we look back. We are up month-to-month from a year ago. Bank interest rates are increasing, however they have not risen to the point where they affect home affordability. This could be similar to the downward trend which occurred at the beginning of last year which was short lived only to see the upward trend continue. The new tax law passed in December 2017 won’t affect the average home buyer in Tarrant County and might cause people from high-tax states to look to move to Texas. The limit of $10,000 deduction for local and property taxes could affect higher end homes, however if someone is buying a home over $500,000 which is twice the average price, tax savings is probably not the primary driver of their decision.